I’m reviewing many design portfolios these days. For those of you who don’t know; when a designer works, they sometimes keep track of a whole project from start to finish. They put it on their personal website almost like a school book report. They include pictures and different versions of the design. This is a good thing to do in general, but I have a problem with the WAY it is being done. These pages are too long in the first place, but let’s assume they have to be long. If you have alot of content, you have to provide navigation. Why in the world would any designer think that scrolling forever is the best way to read a case study? It’s not the best way to present application data. You break it up. It’s called Information Architecture. Navigation and IA is the cornerstone of a good design. It’s just missing most of the time. Additionally, case studies are not typically categorized. I really want to see B2B applications. My request would be to separate Consumer vs Business vs Other designs. Other = industrial, photography, artwork, etc. 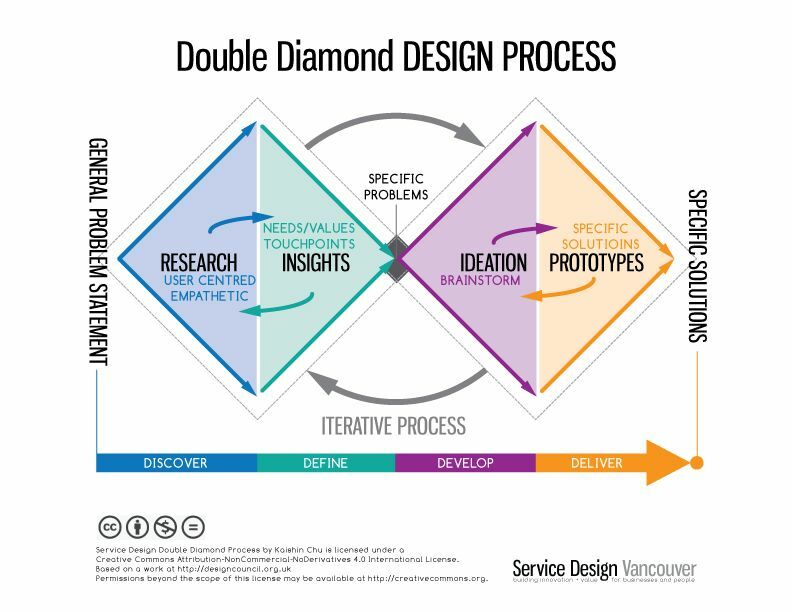 I really don’t understand why designers put a picture of the double diamond process on their case study. Yes, I get it. You use the same process as everyone else in the whole world. You didn’t invent this. It’s common sense. You figure out the problem before the solution. Duh. Why would I care that you wasted paper one afternoon in a meeting that was expensive and unnecessary? How in the world does that tell me you are creative or competent or diligent or productive? It tells me nothing. Honestly, I have never done a sticky note exercise in my life and I would consider the designs I have made to be successful. Plus, the engineers and PMs I have worked with have been collaborative and involved. It’s a pet peeve. I think people do it because someone told them to do it. One thing that drives me crazy is the designer who just does as they are told. I understand that junior designers don’t know the right way to do things. I understand students are trusting souls who think their teachers must know something and refusing instruction will get them in trouble. However, I also know that it won’t help them get hired by me. It tells me they are sheeple who don’t have a design backbone. Someone quote that to their teacher in an HCI program. I would be happy to visit and guest lecture any time. Most case studies start at the beginning and then go to the end. Mission –> Research–>LoFi–>HiFi. This might sound counter-intuitive, but I actually want to see it the other way around. The reason is simple. I am not spending nearly as much time on your site as you would hope. I timed my last 5 site visits. Each candidate got between 2 and 6 minutes of my focused attention. That includes cover letter, resume, LinkedIn recommendations, and portfolio site. In that amount of time, I can’t possibly read all of the words. I am literally going to be scrolling like mad to get to the bottom of the page so I can see your actual designs. My wheel mouse makes the sound “whzzzzzzzzz” until I find it. Think about it, I open up the page and want to see your designs as quickly as possible. Because there is no navigation, I have to scroll for a while until I find it. Then I scroll backwards watching it deconstruct into previous versions. Personally, I like to see iterations. When I get to the research part, I stop. I honestly don’t read the research section at all. There is just no time. I appreciate it being there, but I wish it was hidden. Imagine if you had navigation and each was a separate page. Then you wired up the site with Google Analytics. Finally, ask yourself, “Which sub-pages of my case study are going to get the majority of the views?” If your answer is “they will all equally get read, in detail, by everyone” you are naive. Be a good designer. Get actual feedback from usage. Design for the user. Question for other hiring managers: Time your next 5 candidate reviews. How much focused attention time do you spend per candidate? I don’t care that much about your resume. I care how you design and your site is the one time that no one, NO ONE, can tell you what to do. Spend time on it. Make it great. Be proud of it. Don’t just check the box. You want to be a designer, don’t you? All of these case studies look the same. Why? Don’t you want to stand out? Don’t you want to catch my attention? Why has no one made a portfolio that looks like a business application, complete with navigation, toolbars, buttons, etc? Why do case studies all look the same? It’s not just the design you are showing, it’s the meta too. You are designing an experience to show a project. Tell a story. Make it creative. If you don’t know how to code, you can get an upWork developer for less than $15 an hour. A complicated site probably would cost a few hundred bucks max. Tell your teachers (if you are in an HCI program) that you need to stand out and want to design something better. Tell yourself that.I know some of this might some harsh, but I believe in radical candor. Honesty is the best way to improve the world. I look forward to seeing what you can do. I get what you say but everyone wants to see “the way you think” through the portfolio. The hiring process is broken. Rare are the hiring managers who give feedback or say what they really want to see. I’ve also been to interviews where I had to repeat and explain the whole design process many times, to the whole team. But then, when I started the job, reality was completely different and they were, in fact, looking for a pixel pusher, a design accessory to the engineer and product teams. Thats exactly the point. I don’t want “pixel pushers”. But I also don’t want “process junkies” either. I want creative, driven, communicative, empathetic human beings. I am being honest and transparent about what I look for. So you know at least ONE person who doesn’t think the way EVERYONE thinks.